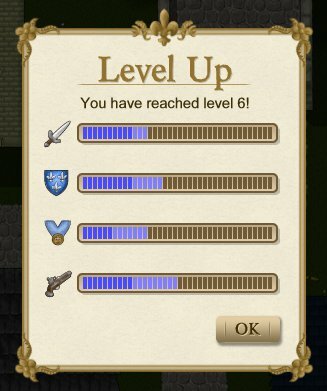 D'Artagnan's abilities can be improved by leveling up, and by acquiring better equipment. The Attack ability reflects d'Artagnan's offensive abilities while fencing. A high value will mean that his enemies will be defeated more quickly. A high Defense value means that d'Artagnan will be able to last longer in battle. He will parry more attacks, and will take less damage. Honour reflects how other characters view d'Artagnan. A high Honour will give you access to more quests and get you better deals from merchants. In addition, many characters will treat you with more respect. This ability is unlocked after acquiring your first musket or pistol. A higher value means that you will do more damage when shooting your opponents.